Courtenay is a city on the east coast of Vancouver Island, in the Canadian province of British Columbia. It is the largest city (and only “city”) in the area commonly known as the Comox Valley, and it is the seat of the Comox Valley Regional District which replaced the Comox-Strathcona Regional District. Courtenay is just 4 km (2.5 mi) west of the town of Comox, 7 km (4.3 mi) northeast of the village of Cumberland, 5 km (3.1 mi) northwest of the unincorporated settlement of Royston, and 108 km (67 mi) northwest of Nanaimo. The city, along with Nanaimo and Victoria is home to The Canadian Scottish Regiment (Princess Mary’s), a Primary Reserve infantry regiment of the Canadian Forces. For thousands of years before the first contact with European explorers, Courtenay had been the home to the Comox people now the K’ómoks First Nation. The K’ómoks people were able to utilize the rich agricultural land to produce crops and proximity to the local waterways allowed for fishing and trade with nearby First Nations people. In the Comox language, K’omoks means “plenty” – resulting in the Valley being known as the “Land of Plenty”. In 1792, Captain George Vancouver, anchored HMS Discovery in what soon would be known as the Comox Harbour and made contact with the First Nations people in the area. In recent years, there has been some speculation whether or not Vancouver was the first explorer to make contact with the people in this area. According to research by Sam Bawlf, it could be that Sir Francis Drake made first contact with them in 1579, on a secret expedition ordered by Queen Elizabeth I. The settlement of Courtenay began in the spring of 1862. The first settlers were coal miners from Nanaimo who were drawn to the area, because it had been known as one of the best agricultural districts in the Colony. The early settlers relied on the knowledge and help of the local First Nations people. They hired them for general labour and farm work, although they were paid low wages as were most non-white people during that time. Many of the settlers ended up marrying or living with First Nations women who provided trading and social connections to surrounding First Nations people. In 1864, Robert Brown, leading the Vancouver Island Exploring Expedition, discovered coal deposits in the Comox Valley, and by 1888 Robert Dunsmuir purchased mining claims in the area. He eventually established a mine in Union, later renamed Cumberland, which brought an influx of settlers, and Chinese and Japanese immigrants. During the establishment of the mining and farming industry, the downtown of Courtenay developed on both sides of the Courtenay River, initially on the east side then the west. The two sides were eventually connected by a bridge in 1874. Courtenay was officially incorporated as a town on January 1, 1915, and eventually designated a city in 1953. The city was named after the Courtenay River, which in turn, was named after George William Courtenay, captain of the British ship HMS Constance, which was stationed in the area between 1846 and 1849. From then on, Courtenay continued to grow providing the necessary services for the growing population. On July 12, 1915, a large fire ripped through 5th Street destroying much of the south side of the downtown. After much of the street was rebuilt, another fire hit the south side of 5th Street, again destroying many of the stores. On June 14, 1946, a 7.3 magnitude earthquake struck just west of Courtenay, with the epicentre located at Forbidden Plateau. The earthquake was felt as north as Prince Rupert and as far south as Portland, Oregon. Many of the town’s chimneys were destroyed, as well there was some significant damage to the post office and the Courtenay elementary school. This was the largest earthquake to hit Vancouver Island, and the largest onshore earthquake in Canada. There were only two reported deaths, one Seattle man died of a heart attack and another drowned when his boat capsized due to a resulting wave. According to Statistics Canada, the city has a total land area of 26.68 km2 (10.30 sq mi). The city is located on the British Columbia Coast and sits on the Strait of Georgia. The climate in Courtenay is very similar to that of the rest of Vancouver Island, classified as a marine west coast oceanic climate. In the summer months it can sometimes be considered to have a Mediterranean like climate due to the low levels of precipitation and drying in the summer months. In the spring and fall seasons, Courtenay tends to be quite cool and wet. The high precipitation levels can be attributed to both the oceanic climate and also its close proximity to the Insular Mountain range which results in the rain shadow effect. Courtenay has quite mild winters, maintaining the cool and damp characteristics, but temperatures can drop below freezing levels and snow may happen throughout the season due to Arctic air movements. As of the Canada 2006 Census, there are 21,940 people, 9,750 private households, and 6,335 families residing in the city. The population density is 822.3 /km2 (2,130 /sq mi). The city has a total of 9,748 private dwellings. The racial makeup of the city is 94.74% non-visible minority, 5.08% Aboriginal (67.3% First Nations and 27.4% Métis people), 1.53% Chinese, 0.75% Filipino, 0.62% Southeast Asian, 0.50% South Asian, 0.48% Black, 0.32% Latin Americans, 0.23% Korean, 0.09% Japanese and 0.05% who list themselves as multiple visible minority. There are 9,750 households, out of which 19.08% are couples with children, 31.74% are couples without children, 31.54% are single person and 17.64% are other. The average household size is 2.2. In the city the population is spread out with 23.15% under the age of 20, 5.81% from 20 to 24, 24.27% from 25 to 44, 28.37% from 45 to 64, and 18.37% who are 65 years of age or older. The median age is 43 years compared to 40.8 for BC as a whole. For every 100 females there are 89.7 males and for every 100 females age 20 and over, there are 86.6 males. For every 100 males there are 111.5 females and for every 100 males age 20 and over, there are 115.5 females. There are 17,135 people in the city with an income, with a median total income of $22,662. Of this income, earnings are 64.7%, government transfers are 16.5%, and other income is 18.8%. There are 11,585 people with earnings and the average overall earnings are $20,529, with an average among full-year full-time earnings of $36,960. In 2006 it was the 61st largest metropolitan area (which includes Comox and Comox Valley B) and the 69th largest urban area. In its early inception, Courtenay’s economy relied heavily on the extraction of the natural resources, like coal, logging, fishing, and agriculture. Over the years as this natural resource extraction decreased, Courtenay has focused its economic growth on supplying services to the large retiree community and the military families at CFB Comox, which is the largest employer in the Valley supplying approximately 1,400 jobs. Tourism has also been steadily increasing and has now become a vital part of the Comox Valley economy. St. Joseph’s General Hospital, Mount Washington home of the Critically Endangered Vancouver Island marmot, Crown Isle Golf Course, Kingfisher Resort and Spa and the Coast Westerly Hotel, and the Airforce base at Comox are in the top 15 employers in the Comox Valley providing 1,200 jobs. Approximately $573.8 million are spent in the retail industry in the Comox Valley, with half of the sales coming from supermarkets, gas stations, and car sales. The average household income is $59,136 which is 16% less than the BC average and 18% lower than the Canadian average. In Courtenay, 60% of the income sources is employment, 19% from pensions, and 6% coming from investments. Every summer, usually in July, the largest music festival, the Island Music Fest on Vancouver Island takes place in the Comox Valley. Performers and audience members from near and far gather for three days of camping and an eclectic mix of music. There are several other festivals in the area and they include the North Island Festival of Performing Arts, Fiddlefest, Comox Valley Highland Games and the Comox Valley Piano Society puts on performances at the Stan Hagen Theatre. The city is home to the Comox Valley Youth Music Centre, originally the Courtenay Youth Music Camp, a two-week-long annual summer school, which has increased to a six-week program. Notable people involved with the centre include Harry Freedman who taught there 1971-1982, Gilles Bellemare (composition), Diana Krall (piano), Nancy Argenta (voice), Ingrid Jensen (trumpet) and Renee Rosnes (piano). The Sid Williams Theatre, located in downtown Courtenay, is the major performance theatre in the Comox Valley. Other theatres include the Rainbow Youth Theatre, the Courtenay Little Theatre and the Stan Hagen Theatre. The Vancouver Island Regional Library has a branch located in downtown Courtenay. The Courtenay branch offers many services such as free WIFI for library members, computer access, and printing and photocopying stations. In recent years, Courtenay has established itself as a hot spot for paleontology discoveries. Professional and amateur paleontologists have been discovering fossils of pre-historic sea life in Courtenay, and the Comox Valley is considered to be the first stop on the Great Canadian Fossil Trail. Millions of years ago Vancouver Island was submerged under a warm salt-water sea, this habitat provided an excellent home to pre-historic marine life. After the Cretaceous–Paleogene extinction event, that caused the extinction of dinosaurs, Vancouver Island began to be shaped by volcanic activity, tectonic plate movement, and glacial ice movements. This activity and glacial erosion along the Puntledge and Trent rivers have revealed some of that 80-million year old sea floor. This access to the ancient sea bed has provided the opportunity for many great marine dinosaur discoveries, like the Elasmosaur and the Mosasaur. The first major paleontological discovery in Courtenay occurred in 1988 when resident Mike Trask and his daughter discovered the first fossil of an 80 million year old Elasmosaur on the banks of the Puntledge River. Over the next few months, the excavation, led by Dr. Roif Ludvigson, revealed a near complete skeleton. The skull and other key bones for identifying the species were in poor condition, and it is still unknown as to what species or genus this Elasmosaur belonged. The original bones and a replica model are on display at the Courtenay & District Museum and Paleontology Center. In 1991, during a field trip, Dr. Joe Zanbilowicz discovered a fossilized bone along the Puntledge River and a few more vertebrae were excavated that day. During the summers of 1997 and 1998, excavation led by Dr. Dirk Meckert revealed a near complete Mosasaur skeleton. After analysis of the skeleton began, paleontologists Dr. Meckter and Dr. Betsy Nicholls, realized this 80-million year old skeleton was a new kind of Mosasaur that had not yet been discovered. They named this new species of Mosasaur, Kourisodon Puntledgensis, for its unique two extra rows of razor-like teeth and its discovery location. After these two large discoveries, there are still many species of animals being discovered, such as desmatochelys (sea turtles), Nanaimoteuthis jeletzkyi (vampire squids), and multiple species of octopods. The Courtenay and District Museum and Palaeontology Centreoffers fossil tours of local rivers and historical exhibits. It is open year-round. The Comox Air Force Museum and Heritage Airpark is located in nearby Comox and has exhibitions from the First World War onwards and is open year round. The Heritage Airpark is home to several aircraft and is open from May to September. Also in Comox is the Comox Archives & Museum which depicts the history of the town. Located in Cumberland is the Cumberland Museum & Archives. The museum which is open year round depicts the history of coal mining in the area. Just north of the city is the Nim-Nim Interpretive Centre. Situated on the Puntledge RV Campground, the site was the original home of the now extinct Pentlatch People, it is named for Chief Joe Nim-Nim. The centre highlights the achievements of the First Nations people of the area. There are several art galleries in the city. The I-Hos Gallery is run by the K’ómoks First Nation and displays modern and traditional BC coastal First Nations art.The Comox Valley Community Arts Council helps to support the Comox Valley Art Gallery and the Muir Gallery. Woodhus Slough is a noted nature area especially for bird watching. Walking trails include Nymph Falls Regional Park, Seal Bay Regional Nature Parkand the Courtenay Riverway Heritage Walk. The Kitty Coleman Woodland Gardens is a woodland garden that was developed by hand. Bryan Zimmerman spent more than two years clearing the brush on his 24-acre (9.7 ha) lot and using a wheelbarrow to make the paths. Community parks include the Simms Millennium Park and Lewis Park. Owned by the city the Simms Millennium Park is a 9-acre (3.6 ha) park that was used during the Second World War as a training area for the D-Day landings. Mount Washington Alpine Resort is the largest commercial ski area on Vancouver Island. Each winter season many flock there to enjoy the seasonal sports such as skiing, snowboarding, cross-country skiing, snow tubing, snow shoeing, sledding and more, as well summer attractions such as mountain bike riding and hiking. The resort has a lot of on-mountain accommodation in the Alpine Village. The Comox Valley Glacier Kings play junior hockey in the Vancouver Island Junior Hockey League in the Comox Valley Sports Centre. They won the 1993-94 VIJHL League Season Championship and the 1994-95 VIJHL Playoffs. In the 2009-10 they were the North Division Playoff Champions. In 2009 the World U-17 Hockey Challenge played several games at the Comox Valley Sports Centre. The City of Courtenay is governed by a mayor and six member council. As of 2012 the mayor is Larry Jangula. Provincially, Don McRae of the British Columbia Liberal Party is the Member of the Legislative Assembly for the Comox Valley electoral district. Prior MLAs include Stan Hagen and Evelyn Gillespie. The city is part of the Vancouver Island North federal electoral district and is currently represented by John Duncan of the Conservative Party. Prior to that the city was in the Comox–Alberni district. Courtenay is served by the Comox Valley Transit System, which is managed and run by the BC Transit Authority, and the cost is shared between the Comox Valley Regional District and BC Transit. Although it is quite small with only 13 bus routes, it provides quick and inexpensive transportation throughout the Comox Valley. From the main bus stop, located on Cliffe Avenue in downtown Courtenay, there are buses that go to Cumberland, Royston, as far south as Fanny Bay, and as far as Oyster River, where a connection to the Campbell River Transit System is offered. BC Transit also operates a handyDART transportation service, for people who have a disability or require extra assistance.In November 2007 as part of a pilot program, the Comox Valley buses were equipped with free wireless Internet access for its passengers. Within the Comox Valley BC Ferries has two terminals, one located in Little River, Comox, and the other south of Courtenay in Buckley Bay. The port in Little River provides service for ferry travel between Powell River and Vancouver Island, while the Buckley Bay ferry terminal provides a route between Vancouver Island and Denman Island. 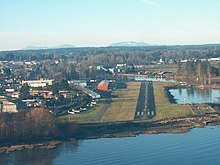 Comox Valley Airport (CFB Comox), which in addition to use by Armed Forces aircraft, is used by WestJet, Central Mountain Air, Pacific Coastal Airlines and Island Express Air. Courtenay Airpark, a small airport located in downtown Courtenay, owned by the City of Courtenay but operated by Courtenay Airpark Association, provides hangar space for recreational fliers and aerial tours of the Comox Valley. Courtenay Airpark Water Aerodrome, also owned by the City of Courtenay and operated by The Courtenay Airpark Association, has daily flights operated by West Coast Air. Courtenay (Smit Field) Airport is a small privately owned airport. Via Rail formerly operated the Victoria – Courtenay train on track owned by the Island Corridor Foundation and operated by the Southern Railway of Vancouver Island (Esquimalt & Nanaimo Railway). The terminus, Courtenay railway station is at the former Canadian Pacific Railway station that was designated a Heritage Railway Station in 1993. St. Joseph’s General Hospital (SJGH) is located in Comox, but serves as the primary hospital for the Comox Valley and surrounding communities from Bowser to Oyster River, with 110 beds earmarked for acute care and 125 for complex care. Courtenay contracts out its police services to the Royal Canadian Mounted Police. Their main detachment is located in East Courtenay along Ryan Road. This detachment provides policing services to the entire Comox Valley. Courtenay also has an active branch of Crime Stoppers to help provide the Comox Valley information about recent crimes and a way to provide anonymous tips. Fire services are provided by the Courtenay Fire Department, and it is one of the five volunteer fire departments that operate in the Comox Valley. The Courtenay Fire Department has 42 career and paid-on-call firefighters that provide fire suppression, auto extrication, fire safety education, and the issue of fire permits. Courtenay ambulance services are provided by British Columbia Ambulance Service. Courtenay has numerous public schools operated by School District 71 Comox Valley. In the 2007 school year, School District 71 had 9,197 students enrolled. Courtenay is home to the largest North Island College Campus with approximately 1,669 students enrolled in credit classes and an additional 1,393 enrolled in short term or vocational courses. The campus is complete with cafeteria, bookstore, library, and the notable Stan Hagen Theatre that holds many community events. The Comox Valley Campus offers many certificate, associate degrees, and bachelor degree programs, and is known for its Bachelor’s of Nursing program and its Professional Photography Certificate. There are two newspapers in the city, the Comox Valley Echo and the Comox Valley Record. There are two radio stations, CKLR-FM and CFCP-FM.